Some interesting illuminations in London photographed on my visit there with Ben this month. The inset shows St. Pauls in Covent Garden, known as the actor’s church â€“ the Christmas tree silhouette, projected from the market building, is a great example of low-cost high-visibility environmental graphic design. When I was a student at the AA in the late 50’s, and when this was a real market, we often used to visit an all-night pie stall which lived on the right of the church entrance under the stained-glass window. 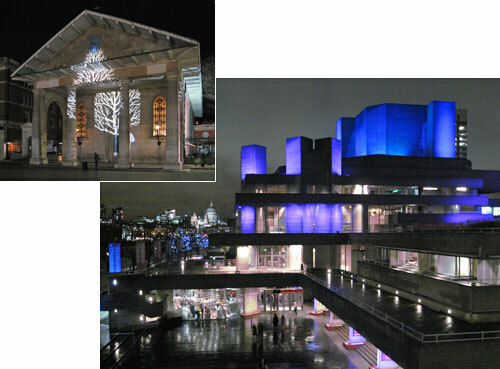 The other image shows the more well known St. Pauls in the background, behind the National Theatre on the South Bank, whose lighting changes color from day to day. All different and festive examples of creative lighting design.